When visiting Jaisalmer, many tourists opt to stay inside its living 9th century sandstone fort. It's a unique experience. However, what they may not be aware of is that the condition of the fort is rapidly deteriorating, as drain water is seeping into its foundations. Increasing commercial activities are posing a danger to the fort and the situation has become so concerning that the government wants to move people out of the fort. So, what's best the alternative? Staying at accommodations with mesmerizing views of the fort! 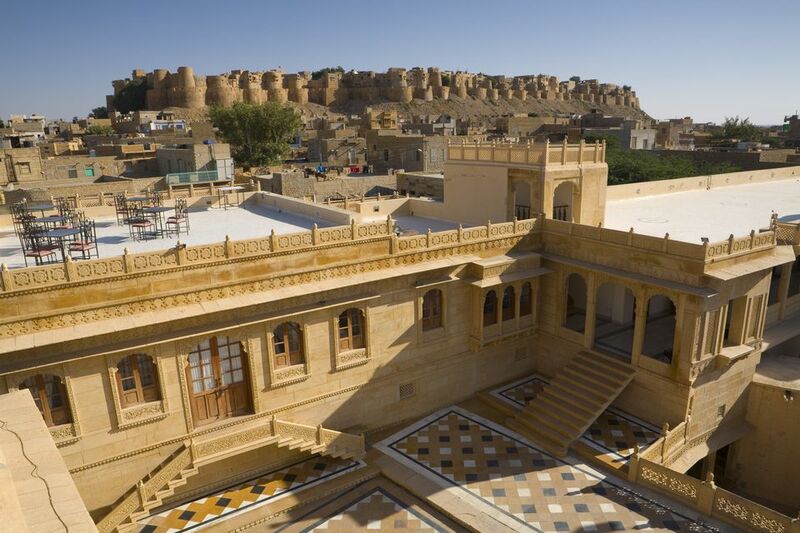 You'll find many Jaisalmer hotels with panoramic fort views from their rooftops and fort-facing rooms. Here are eight of the best ones, for all budgets. Do note that substantial discounts are available during the low season, from April to September. On a strict budget? Check out the groovy new backpacker hostels in Jaisalmer that have opened up around the fort. Many have private rooms as well as dorms. If you're looking for an authentic haveli hotel with a contemporary feel, don't hesitate to stay at boutique 1st Gate Home-Fusion. Located just outside the fort walls, this exceptional hotel couldn't have a better location! Its eight rooms have been stylishly renovated in warm golden tones, with restored teak floors. One of the hotel's main attractions is its rooftop restaurant (with fabulous fort views of course), renowned for its delicious Italian and Indian vegetarian fusion food. There's also a lounge bar with cocktails and live music. Room rates start from 7,500 rupees per night, plus tax. Now, here's something you won't get if staying inside the fort -- a swimming pool! And yes, this 18th century heritage hotel is actually a real palace, as the royal family of Jaisalmer still resides in part of it. The property has been meticulously carved out of stone with Indo-Saracenic architecture. Its ornate balconies and canopies are exquisite. There are 28 rooms for guests, including six suites. The suites are really special, as they're all personal rooms of former rulers. The Golden Suites date back to 1770 and 1850, while Surya Mahal Suites were built later in 1914. Other features include a small museum, and landmark Badal Vilas tower. Expect to pay 7,000 rupees for a room, 16,000 rupees for a Golden Suite and 22,000 rupees for a Surya Mahal Suite. Want plenty space and luxurious modern facilities without having to sacrifice fort views? The Gulaal is a new boutique hotel that's been constructed in traditional style on the outskirts of Jaisalmer (but still withing walking distance of the fort). It gets its name from the colored powder that's thrown during the Holi festival. Building new rather than renovating has allowed the hotel's design to be finely planned. There's a sprawling garden and pool area, spa pavilion, two open courtyards for ventilation, rooftop restaurant and 12 very spacious guest rooms. Expect extra touches like bowls full of flowers in the communal areas, and flickering candles on the rooftop. It's a very elegant and romantic hotel! The staff are super congenial as well. Rates start from 5,100 rupees per night for an air-conditioned double, with breakfast included. The very popular Hotel Pleasant Haveli receives near faultless reviews. It's located less than ten minutes walk from the fort and has nine uniquely-themed rooms, each decorated in a different color. The hotel's restaurant serves reasonably-priced tasty food and the rooftop terrace is furnished with gorgeous bright cushioned sofas. Staff are attentive and caring. You definitely wont regret staying here! Do note that emphasis is placed on maintaining a quiet and "pleasant" atmosphere, so the hotel isn't really suited to families with young children. An added bonus is its camel safaris are authentic and not touristy. Room rates start from 2,500 rupees per night, plus tax. Another popular and beautifully decorated stone haveli hotel, Hotel Fifu is named after the congenial family that owns and manages it. Their admirable mantra -- "hospitality with honesty". The hotel is located around 15 minutes walk from the fort, but don't let that deter you from staying there. It has three cushioned terraces with magnificent fort views to enjoy. There are eleven rooms spread over three floors and the north facing rooms also have fort views from their window seats. The south facing rooms have desert views. Expect to pay 2,450 rupees upwards for a room, not including tax or breakfast. The vegetarian Indian and Continental meals served on the rooftop restaurant are simple but good. Hotel Shahi Palace is possibly the most popular budget hotel in Jaisalmer, and it's conveniently located super close to the fort walls. The atmosphere is friendly and relaxed, with a highlight being the bonfires that are lit on the rooftop in the evenings for travelers to sit and chat around. The traditionally decorated rooms, made out of Jaisalmer sandstone, are clean and comfortable. There are 16 to choose from, with different sizes and amenities to suit various budgets. Some have fort views. The cheapest ones, costing 350 rupees per night, share a communal bathroom and don't have windows. Dorm beds are also available for 100 rupees a night. Shahi Palace also runs reputable camel safaris. Mystic Jaisalmer is a value-for-money boutique hotel with outstanding customer service, which has continued to improve over the years. The hotel moved to its current premises, in the center of Jaisalmer, in 2012. Gadsisar Lake, market and fort are all within ten minutes walking distance. The hotel's wide range of rooms include fort-view rooms. They're clean, spacious and attractively decorated. The newly redesigned rooftop restaurant serves tasty Rajasthani food. Those who'd prefer a hammock and banana pancake and will find it at the hotel's rooftop cafe. Rates start from 2,500 rupees per night for a standard double room, including breakfast, and go up to 5,500 rupees. The hotel offers honeymoon packages, desert experiences, and of course camel safaris, as well. Although this hotel's name certainly sounds out of place in Jaisalmer, its owner is not. He was born in the Jaisalmer desert but spent part of his career managing an Indian restaurant in Tokyo. He's applied his experience to Tokyo Palace, which he opened in 2010. The property was newly constructed to resemble an old haveli and is situated just a few hundred meters from the fort. What makes this budget hotel stand out from the others in the area is the fact that it has a small swimming pool. In addition, there's a library and kitchen that guests can use. The only drawback is that staff are known to focus on selling tours. The 15 guest rooms are spread over four categories, included dorm rooms, with rates starting from 1,500 rupees per night for a private double. Expect to pay 200 rupees per night for dorm bed. If you'd like a bathtub, book a suite, for around 3,000 rupees per night.